It has earlier been reported that Power Star Pawan Kalyan's "Sardaar Gabbar Singh" (SGS) will be released in Hindi with the same title. Now, the producers of the film have released the teaser of its Hindi version on the Internet. The teaser of "Sardaar Gabbar Singh" has been released on the official YouTube channels of Eros International and Northstar Entertainment Pvt Ltd and is getting good response from the audience. Many viewers, who are impressed with the teaser, shared it on their Twitter and Facebook pages. Power Star Pawan Kalyan is one of the most popular actors in South India. His movies were released in different parts of north India and they impressed the viewers there. Most of his recent releases were dubbed in Hindi and aired on different Hindi TV channels. He has decent amount of fan following in the northern part of the country though he has not starred in any Bollywood movie. 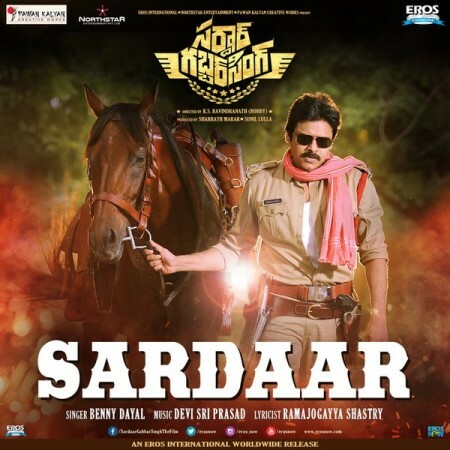 The makers of "Sardaar Gabbar Singh" have planned to dub the movie in Hindi and release it in North India to cash in on the popularity there. They have teamed up with Eros International, which is one of the India's leading production and distribution companies and has several hit Bollywood films to its credit, and recently made an official announcement of its Hindi version.Makers have already started the promotion of its Hindi version by releasing its poster. Sharrath Marar informed his followers, March 14, that the teaser of the Hindi version of "Sardaar Gabbar Singh" would be released Thursday. "#SardaarGabbarSingh for an all India Release. Hindi teaser to go Live on Thursday followed by the Telugu teaser. #PSPK #PawanKalyan," he tweeted.